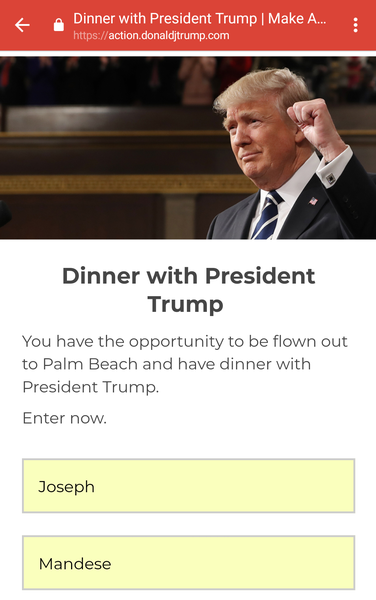 The email said the “approximate retail value” of the sweepstakes is $3,000, and that one winner would "receive round-trip transportation and accommodations and tickets to attend a dinner with President Trump at the January 20, 2018 Trump Victory Dinner in Florida." So here’s the deal -- if I do win, I’ll post another Email Insider inviting readers to make the best case for being my guest. How did I get on the list for this once-in-a-lifetime opportunity? The only thing I can deduce is that I entered Trump’s “Fake News Awards” poll a couple of weeks ago, so I’m probably in their database now.